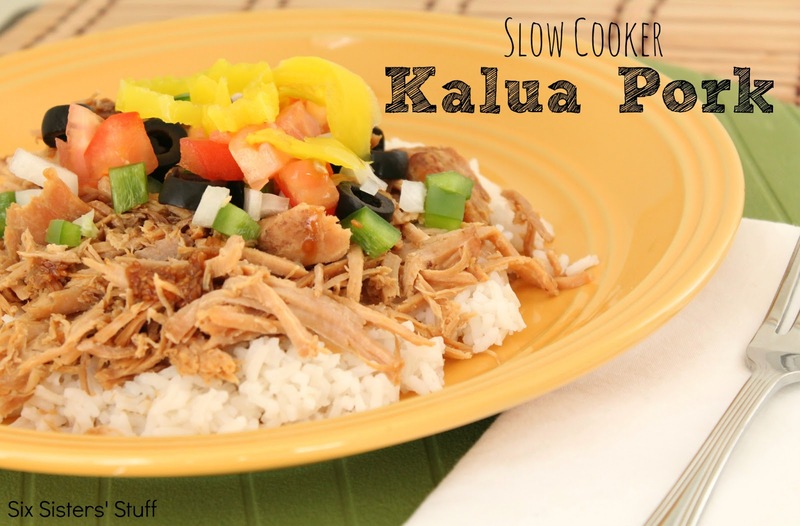 This Slow Cooker Kalua Pork is so simple and full of amazing flavor. We love cooking pork roasts in our slow cooker because the meat is so tender and juicy. This is definitely a recipe you will want to try. This is seriously one of the EASIEST recipes to make and it tastes AMAZING. My husband and I attended a luau where they served this for dinner- we asked for the recipe and have made it at least a dozen times since. When cooking your pork roast, it is important to remember that they cook quicker than most other meats. Pork can also be a little more dry, although most roasts are a little more tender. Cook them on low, for a longer amount of time. This will help the juices soak into the meat, and not cook out quickly. It will also help avoid the meat from cooking fast on the outside, but not on the inside, leaving you with burnt pork. Let your pork chops marinade for a while, and even make a little extra sauce to put on the side, to baste them as they cook. In the slow cooker, they are pretty much marinading the entire time they cook, but it doesn’t hurt to spoon some juices on top every now and then. Don’t cut into the pork as it is cooking. If you do, make a small incision in the very center to ensure that the meat is done cooking, or a thermometer to see that it has reached the temperature of 145 degrees. You also don’t want to open the slow cooker lid if you don’t have to. It’s best to keep all that sweet meat moisture in the slow cooker, for a nice tender pork. This 3-ingredient Kalua Pork roast is SO tasty! It's on our monthly meal rotation every time! Pierce pork all over with a carving fork. Rub salt and liquid smoke over meat. 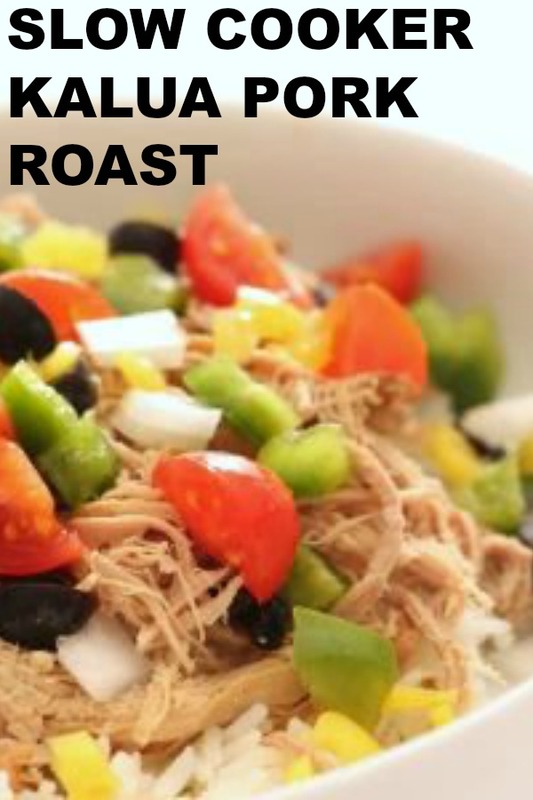 Place roast in a slow cooker, cover and cook on low 10-12 hours. Turn once about halfway through cooking time. Remove meat from slow cooker and shred with 2 forks, adding drippings as needed to moisten. Serve over rice, topped with your favorite veggies and teriyaki sauce. This pork also makes a great salad topping, or meat for tacos, burritos, or quesadillas. how much water do you have to add to the slow cooker - enough to cover the meat? or just an inch or so in the bottom? Don't need to add any water. The juices from the meat will be plenty. This is like the recipe from Skinny Taste, but Gina's cooks a lot longer. It's SOOO good! I just made this last night and it was SUPER DELICIOUS and so, so easy! I've never used liquid smoke before but it was definitely worth buying. Thanks for the recipe, we will definitely be making it again. I found 2 different liquid smoke flavors; did you use hickory or mesquite?? I actually use hickory, but I bet that mesquite would be awesome to!! This was so good and such a fresh twist on pulled pork. The cucumber seemed an odd addition, but was my favorite part of the dish. I made this today. IT WAS AMAZING!!!! Thank you for the recipe!! This reminds me of the Chop Chop bowls they serve at Pollo Tropical here in Florida. The biggest difference is that at the restaraunt the pork is served over yellow rice and you can get black beans and sauted onions added if you want. I may try this recipe soon to see if does resemble the chop chop bowls. How would you modify the recipe to use pork chops instead of a pork roast? I love a more smokey flavor, so put more liquid smoke. Add a little garlic powder... makes this over the top! I've made this in huge amounts for fundraisers and groups. Just put it on bun as a sandwich. Coleslaw on the sandwich is yummy, too! What is liquid smoke and where in the grocery store do I find it?